Indexed universal life insurance (IUL) is a universal life insurance policy that offers a choice between a fixed interest rate paid on cash values or a rate that varies depending on the movement of an index chosen by the policyholder. The index that is followed can vary from company to company or even product to product, but the most popular option by far is the S&P 500. A common misconception of IUL is that policyholders gain exposure to the stock market because of the indexing feature and therefore face market risks. Nothing could be further from the truth. IUL is not a way to gain exposure to the stock market, and it should never be construed as such. The indexing feature is merely an alternative method of determining the interest rate at which money in an IUL insurance value of the policy will earn. The indexing feature itself generally has a cap on the interest rate. For example, if the cap on the indexing account for the S&P 500 is 12%, any rise in the S&P beyond 12% will not affect the interest rate; it will remain at 12% and go no higher. The indexing feature also has a participation rate that determines how much of the rise in the index will actually go towards the interest rate. For most products, the participation rate is 100%, meaning the interest rate will be whatever the move in the index is up to the cap. There are a small number of non-capped products with differing participation rates. The index account itself tracks a specific period of time chosen for which the policyholder has an array of options. This time period can be over the course of one year, one month, several years, etc. The most common option is one year. Since it’s universal life insurance, it also affords the policyholder complete flexibility as regards premium payments amount and timing. This allows policyholders to reduce their planned premiums down to zero if need be and make up these reductions in later years should they choose. It also allows policyholders to resume funding a policy several years after having stopped if they find themselves in a financial advisors situation that allows them to do so. To further speak to the difference between IUL insurance and a direct investment in the stock market, take the following graph that depicts the real historical results of a savings plan using this insurance, the S&P 500, and an S&P 500 index mutual fund from 2001 to 2014 (one of the most volatile periods in the U.S. stock market). Notice that at no point does the line that shows the accumulation of cash in the IUL insurance ever have a negative slope (i.e., it never declines in value). This is because the market indexes universal life insurance will never have a negative interest rate, and therefore, a loss because of market declines is not possible with this insurance policy. It’s important to note that IUL gains are calculated from movement in the market, but because it resets the time period every year, month, etc., the movement need not be a net gain in the stock market following a loss. Take a look at 2007 through 2010 on the graph as an example. By the end of 2010, the S&P 500 and the S&P 500 index fund had not yet returned to the level they were at the beginning of 2007. The policy had a very small gain in interest from 2007 to 2008 because of the decline in the market, but it also enjoyed substantial gains from 2008 through 2010 as the market recovered. The volatility seen in the market itself is nonexistent in this insurance policy. What if Interest Rates Rise and Stall-out the Market? This insurance has a great hedge against rising interest rates that could potentially cause a sharp decline in U.S. equities. Since the product also has a fixed interest rate account that is designed to compete with fixed interest savings products, a rise in interest rates potentially means a switch to the fixed interest account from the indexed account. The market declines or even stalls for a few years, while the policyholder enjoys higher interest rates in the fixed account created by rising market interest rates. Meanwhile, no decline in the stock market itself causes the policyholder to lose money. 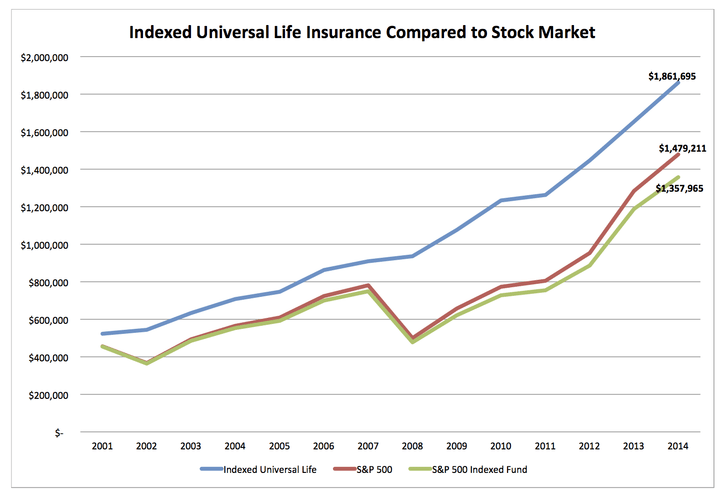 IUL insurance, just like all other forms of fixed account cash value life insurance products, is a stock market neutral product (i.e., it does not decline in correlation with the stock market the way several other savings vehicles do). This makes it a wonderful complement to any portfolio to diversify risk or a great refuge for those who are spooked by market volatility and want to minimize their exposure. But, it also has high potential to deliver very competitive growth to policyholders since it gains substantially from movement in the stock market. Whether that movement be a continued bull market or a recovering market following a correction, positive gains over the time period tracked by the indexed account can net huge growth to policyholder cash values. It’s for this reason that this insurance continues to be the fastest growing life insurance product on the market. And, despite what many will tell you, it also works as a great product for infinite banking/bank on yourself. If you’re still skeptical or would like to know more, don’t hesitate to contact us.